You'll be £20.00 closer to your next £10.00 credit when you purchase A Railway History of New Shildon. What's this? On the 27th September 1825, the first public railway steam train left New Shildon for Stockton-on-Tees. The driver was George Stephenson and the engine he was driving was the ‘Locomotion No.1’. It set off from a settlement which would become New Shildon. At the time it consisted of just a set of rails and four houses, none of which had been there less than a year before. The four houses became a town with a five-figure population; a town that owed its existence to the railway that made its home there - the ‘Stockton and Darlington’(S&DR). Some of the earliest and greatest railway pioneers worked there, including George and his son Robert, the Hackworth brothers, Timothy and Thomas, and the engineer William Bouch. Their story is part of New Shildon’s story. The locomotive works, created to build and maintain steam locomotives, morphed into the world’s most innovative works whose demise had more to do with politics than productivity. 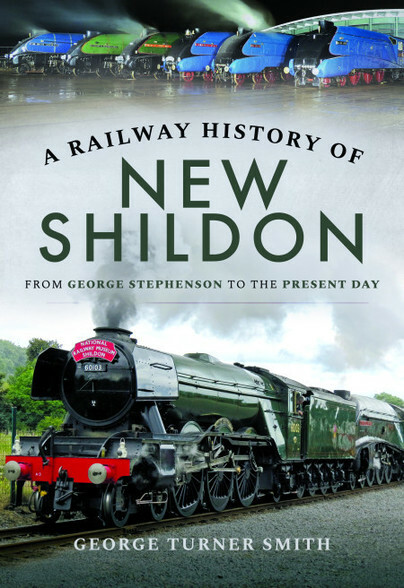 This book covers Shildon's years between 1820 and today, including the war interludes when the wagon works was manned by women and the output was mostly intended for the MOD. The story of the creation of the town's railway museum and the arrival of Hitachi at Newton Aycliffe brings the history up to date and , to complete the picture, there is also a description of the on-going new build G5 steam locomotive project on Hackworth Industrial Estate, the very site where the S&DR locomotive and wagon works was located. Although the story of a railway town, it is also the story of people who lived there and made it what it is today. After leaving his home town of Hartlepool, following graduation as a chemist. George spent several years in the chemical industry before turning poacher/gamekeeper as a pollution regulator. He began writing more than twenty years ago, concentrating on railway history, an appropriate choice since both his father and paternal grandfather were railwaymen. He has written extensively for railway magazines and has five published railway books and one fiction book to his credit. Now retired, he lives in the Midlands and is married with three grown up children and five grandchildren, none of whom have the slightest interest in railways.